Definition at line 127 of file compobj_private.h. Definition at line 145 of file compobj_private.h. Definition at line 136 of file compobj_private.h. Referenced by apartment_construct(), apartment_freeunusedlibraries(), apartment_getclassobject(), apartment_hostobject_in_hostapt(), apartment_release(), CoRegisterMessageFilter(), find_proxy_manager(), get_local_server_stream(), get_stub_manager(), get_stub_manager_from_ipid(), get_stub_manager_from_object(), new_stub_manager(), proxy_manager_construct(), start_apartment_remote_unknown(), and stub_manager_int_release(). Definition at line 129 of file compobj_private.h. Referenced by apartment_construct(), and apartment_release(). Definition at line 152 of file compobj_private.h. Referenced by apartment_release(), and CoRegisterMessageFilter(). Definition at line 143 of file compobj_private.h. Definition at line 142 of file compobj_private.h. Referenced by apartment_hostobject_in_hostapt(), and apartment_release(). Definition at line 135 of file compobj_private.h. Definition at line 141 of file compobj_private.h. Referenced by apartment_construct(), apartment_freeunusedlibraries(), apartment_getclassobject(), and apartment_release(). Definition at line 144 of file compobj_private.h. 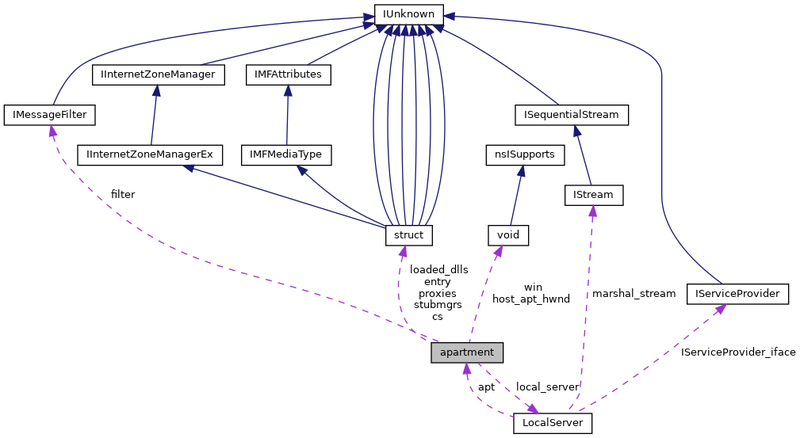 Referenced by apartment_release(), and get_local_server_stream(). Definition at line 153 of file compobj_private.h. Referenced by apartment_get_or_create(), and get_inproc_class_object(). Definition at line 132 of file compobj_private.h. Referenced by apartment_construct(), apartment_createwindowifneeded(), apartment_getwindow(), apartment_is_model(), ClientRpcChannelBuffer_GetBuffer(), ClientRpcChannelBuffer_SendReceive(), CoRegisterMessageFilter(), dispatch_rpc(), and get_inproc_class_object(). Definition at line 148 of file compobj_private.h. Referenced by apartment_construct(), and new_stub_manager(). Definition at line 134 of file compobj_private.h. Referenced by apartment_addref(), apartment_construct(), apartment_findfromoxid(), apartment_get_or_create(), apartment_getoxid(), apartment_release(), ClientRpcChannelBuffer_GetBuffer(), COM_GetRegisteredClassObject(), COM_RevokeAllClasses(), CoRegisterClassObject(), CoRevokeClassObject(), LocalServer_QueryService(), new_stub_manager(), proxy_manager_get_remunknown(), and RPC_StartRemoting(). Definition at line 137 of file compobj_private.h. Referenced by apartment_construct(), apartment_disconnectproxies(), find_proxy_manager(), and proxy_manager_construct(). Definition at line 131 of file compobj_private.h. Referenced by apartment_addref(), apartment_construct(), apartment_release(), CoAddRefServerProcess(), and CoReleaseServerProcess(). Definition at line 140 of file compobj_private.h. Definition at line 139 of file compobj_private.h. Referenced by apartment_construct(), and start_apartment_remote_unknown(). Definition at line 138 of file compobj_private.h. Referenced by apartment_construct(), apartment_release(), get_stub_manager(), get_stub_manager_from_ipid(), get_stub_manager_from_object(), and new_stub_manager(). Definition at line 133 of file compobj_private.h. Referenced by apartment_construct(), apartment_findfromtid(), ClientRpcChannelBuffer_GetBuffer(), and dispatch_rpc(). Definition at line 151 of file compobj_private.h. Referenced by apartment_createwindowifneeded(), apartment_getwindow(), and apartment_release().